Do you feel as though you’re floored by all of the options for installing new flooring in your home? Consider ceramic tile for its style, design, its contribution to your health, and the fact that it’s also cost-effective. Ceramic tile offers an ease of maintenance that is sure to complement your busy lifestyle, requiring only a sealant applied once about every four years. Cleaning your ceramic tile is also a breeze. Because of ceramic tile’s protective layer, stains and liquids stay on the tile’s surface, so your ceramic tile requires only the regular sweeping or vacuuming that you would give to any standard flooring. This protective layer also ensures your ceramic tile is resistant to high humidity, making it ideal for use in your bathroom or kitchen. If you’re looking for style, you can’t go wrong with ceramic tile. Ceramic tile flooring provides a finish and look that complements any space in your home, whether it’s your bathroom, kitchen, hallway, or even your living room. From bright colors to hushed tones, ceramic tile offers a rainbow of possibilities for your flooring needs. Ceramic floor tiles provide a wide range of design options due to their variety of sizes. Whether you decide to go for smaller tiles or larger square options, ceramic floor tiles are easily adaptable to all applications. Ceramic floor tiles hold up easily under stress and are especially hard to crack. If you have a pet, you don’t need to worry about the tile’s surface standing up to your four-legged friend’s tough nails. And if a single tile should ever crack from severe impact, replacing it is fairly simple. Ceramic floor tiles provide benefits above the surface as well, contributing to your indoor air quality. For one thing, they are fired in high-temperature kilns, resulting in few or none of the volatile organic compounds (VOCs) that often add to health problems. Also, ceramic floor tiles keep your home cooler in the summer and provide added insulation in the winter, helping to reduce your energy bills. Are there allergy sufferers in your home? 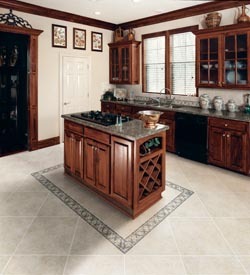 The hard surface of ceramic floor tiles keeps them from attracting dust, dirt, or pollen. Should occasional allergic debris land on your ceramic floor, it will stand out against the surface so that you can see it and wipe it away easily. A ceramic floor made of tile isn’t only worth its weight in aesthetic value. You’ll also discover what ceramic floor tile can do for your home’s resale value if it ever goes on the market. An impressively designed and installed tile floor has timeless appeal and can potentially add thousands of dollars to the worth of your house. Contact us today at <PHONE> to find out more about the benefits of ceramic tile flooring. We proudly serve the communities of Little Rock, North Little Rock, Benton, Maumelle, Conway, Hot Springs, and Searcy, Arkansas.